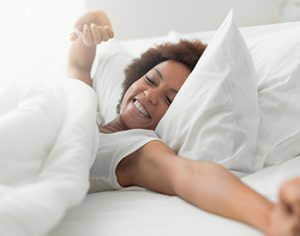 There are plenty of ways to try and improve your sleep, such as getting enough exercise, drinking calming tea before bed or putting your phone away to give your eyes a rest. But have you ever thought about how your bedroom itself could affect your ability to sleep? The way you arrange and decorate your bedroom can actually have a big impact on how relaxed and comfortable you are, which in turn affects how well you sleep. Getting a good night’s rest is crucial because of how much it affects your daily life. If you are having trouble sleeping, you have probably tried all of the homeopathic and prescription remedies you could think of. If you haven’t considered changing your bedroom before, now might be the perfect time to give it a chance. Learn everything you need to know about setting up your room for a better night’s sleep below. For many reasons, it is beneficial to have your bed against a wall rather than in front of a window. Not only will having your bed against a wall cut down on drafts from the window, you also will have a brighter and more cheerful room during the day if your bed isn’t blocking any sources of natural light. You have been sleeping on the same bed for more than seven years. You constantly wake up with aches and pain. Your mattress sags or has lost its original support. You sleep better when you stay in other places. Your bed isn’t big enough for those who sleep in it, such as you, your partner or any pets that may sleep in the bed. When looking at new mattresses, it is important to test them out in the store but also in your home. Most stores allow you to try a mattress for a month or two at home before you fully commit. It always takes some time to get used to a new bed, so it is a good idea to take advantage of any trial period you may be afforded. You probably don’t sleep with any lights on in your bedroom, but the lighting in your room can affect how relaxed you feel before falling asleep. Getting light bulbs with a lower wattage is a good idea for any bedside lamps, as the ambient light will give a gentler effect that helps you feel calm before going to bed. If you have other lamps near a desk or vanity mirror, brighter bulbs may be your best bet there so you don’t have to strain your eyes to see. Whether you live in the city or the middle of nowhere, no house is completely silent at night. Distracting noises can come from heating and cooling systems, electronics, sounds from outside and more. A fan or white noise machine can help block out these distractions at night and give you a more peaceful rest. Even a small fountain can provide background noise that blocks out distracting sounds. Having the TV on in the background is not usually a good way to create white noise, as the brightness from the screen can be an even worse distraction. The amount of light in your bedroom can significantly affect the quality of your sleep. If you, like most people, naturally feel more awake during daylight hours, bright lights during the night can disrupt your sleep. Streetlights, digital alarm clock displays, cell phones and computers can all create distracting light in your bedroom. It is easy enough to turn off your phone or computer at night so notifications don’t light up your screen while you’re trying to sleep. To cut down on the light that your digital clock is giving off, you may want to consider switching to a clock with a dimmable light or an old-fashioned clock with no digital display at all. To cover up unwanted light from outside, consider getting blackout curtains, which will block out virtually all bright lights. The human eye is drawn to symmetry because it creates a balanced look, which can make a room feel more peaceful. Looking at symmetrical decorations allows your brain to process information with minimal effort, which is both aesthetically pleasing and calming. If you have pictures or artwork hanging in your room, strive to make the hangings symmetrical. Any pieces hanging over the bed should be centered, and any frames on other walls should have a counterpart to create more balance. The principle of balance also applies to things such as bedside tables, lamps and even the pillows on your bed. Nothing is more distracting than a cluttered bedroom when you’re trying to relax. Not only does your mind have to take in all the visual information that comes from clutter, seeing a mess can also make you feel stressed out. Instead of thinking about sleep, you may find yourself focusing on the pile of clothes you should throw in the wash or the clutter that has accumulated on your shelves. With a clutter-free bedroom, you don’t have to feel anxious about chores that are left undone. Bright colors and vibrant patterns can be fun in other areas of your house, but you may want to reconsider using these in your bedroom. Muted, neutral colors are a better choice for your walls because they will be easier on your eyes when you’re trying to relax. Colors that inspire relaxation include greens, blues and pale yellows, while colors such as red can cause feelings of anxiety. A bedroom can still have a nice pop of color here and there, but you may want to reserve bright colors for artwork and accent pillows rather than your walls.